The Dark Knight: ...And Tom Waits As The Joker? It's uncanny how every so often, the Internet cranks out something old, re-christens it as new again, and we all get worked up by how cool it is. Such is the case with an old clip from The Don Lane Show, an Australian talk show, which the Internet has recently discovered and seized upon as proof of a theory (that's been around for a while) by some fans that the late Heath Ledger may have modeled his Oscar-winning portrayal of The Joker on singer/actor Tom Waits. Check the clip below for a little taste of what everybody's talking about, coming to you in living color from the year 1979. 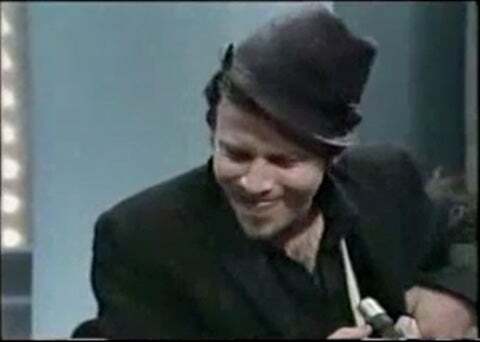 In all of the discussion, though, an important fact has been lost; in addition to classics like Down By Law and Coffee and Cigarettes from indie darling Jim Jarmusch, Waits appeared in one of the most entertaining and underrated superhero movies of all time. That's right, folks: we're talking about Mystery Men, based on the characters created by Flaming Carrot creator Bob Burden--and if you can't objectively call that a good film, you certainly have to admit that any movie that puts William H. Macy, Ben Stiller, Janeane Garafaolo, Eddie Izzard, Paul "Pee Wee Herman" Reubens and Waits in a room together has something going for it. Waits also starred in The Imaginarium of Dr. Parnassus, Terry Gilliam's trippy movie which starred Ledger in the lead role--and which became even more trippy afte the star passed away and had to be replaced by the likes of Johnny Depp and Colin Farrell in a number of dreamy, alternate-reality scenes to finish out the film. Believe it or not, it worked in context. This particular clip, in which Waits appears particularly Joker-esque, surfaced late last week on Newsarama before going viral over the weekend. "It can’t be a coincidence that Ledger’s Joker sounds exactly like Waits’ in this 1979 interview," argues Starcasm, who also drew the Dr. Parnassus parallel, pointing out that the movie was shooting around the same time as The Dark Knight.